Last week I asked Nicola to look through some of my cook books again as I had got to the point where I felt that I was cooking the same things over and over. My instructions were simple, look through the books and make a note of any meal that she would like me to prepare. If the marked recipes could be prepare quickly, I would add them to my midweek repertoire as soon as I could. The first meal on the list was a very simple Sesame and Ginger Pork Stir-Fry which was full of flavour and took less than twenty minutes to reach the table. Mix together the soy sauce, sesame oil and ginger in a shallow dish. Add the pork to the marinade and season with black pepper. Toss together and set aside for 5 minutes. Heat a wok and toast the sesame seeds (There's no need for oil) for a few minutes until coloured and fragrant. Remove from the wok and set aside. Lift the pork from the marinade and add to the hot wok. Sear the pork until browned all over. Remove from the wok and set aside. Add the vegetable to the wok, pour over the remaining marinade and stir-fry everything together for 3 minutes. Return the pork to the wok , continue to stir-fry for a further 2-3 minutes. Cook the egg noodles in boiling water for about 2 minutes, until tender. Drain the noodle before adding a splash of soy sauce, toasted sesame oil. 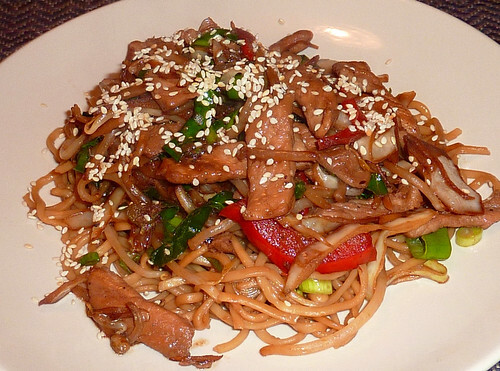 To serve, divide the noodles and contents of the wok between two plates and sprinkle with the toasted sesame seeds. All of the ingredients for this stir-fry are things that I would normally have in the fridge, which is just as well as dinner was delicious, and I expect to see it on the menu again in the coming weeks. This is a great idea - going through the books with someone else to get some new inspiration. Maybe I'll try it out!